What’s in Al Jazeera’s Film on Israel Lobby? The annual conference of the American Israel Public Affairs Committee — AIPAC — runs through Tuesday. Among the speakers tonight are Vice President Mike Pence and Democratic minority leader Nancy Pelosi. Winstanley is an investigative journalist and associate editor at The Electronic Intifada. He just wrote the piece “What’s in Al Jazeera’s undercover film on the U.S. Israel lobby?” The piece states: “The leading neoconservative think tank Foundation for Defense of Democracies is functioning as an agent of the Israeli government, Al Jazeera’s forthcoming investigation on the U.S. Israel lobby will reveal. “Under the Foreign Agents Registration Act, commonly known as FARA, U.S. organizations and individuals who work on behalf of foreign governments are required to register with the counterintelligence section of the Department of Justice. “A search on the FARA website shows that the Foundation for Defense of Democracies is not registered. “Al Jazeera’s film reportedly identifies a number of lobby groups as working with Israel to spy on American citizens using sophisticated data gathering techniques. The documentary is also said to cast light on covert efforts to smear and intimidate Americans seen as too critical of Israel. “In October last year, Clayton Swisher, Al Jazeera’s head of investigations, first announced that the Qatari satellite channel had in 2016 run an undercover journalist in the U.S. Israel lobby. “That documentary, broadcast in January 2017, exposed Israel’s covert influence campaign in the UK’s ruling Conservative and opposition Labour parties. The film revealed an Israeli embassy agent plotting with a British civil servant to ‘take down’ a government minister seen as too critical of Israel. “Although Swisher promised the U.S. film would come out ‘very soon,’ nearly five months later it has yet to be broadcast. “Over that same period, a wave of Israel lobbyists has visited Qatar at the invitation of its ruler, Emir Tamim bin Hamad Al Thani. 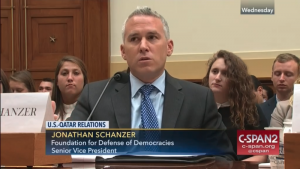 “Ironically, pro-Israel members of Congress are now pressuring the Department of Justice to force Al Jazeera to register as an arm of Qatar, under the Foreign Agents Registration Act, just as the Russian-funded network RT was recently forced to do.